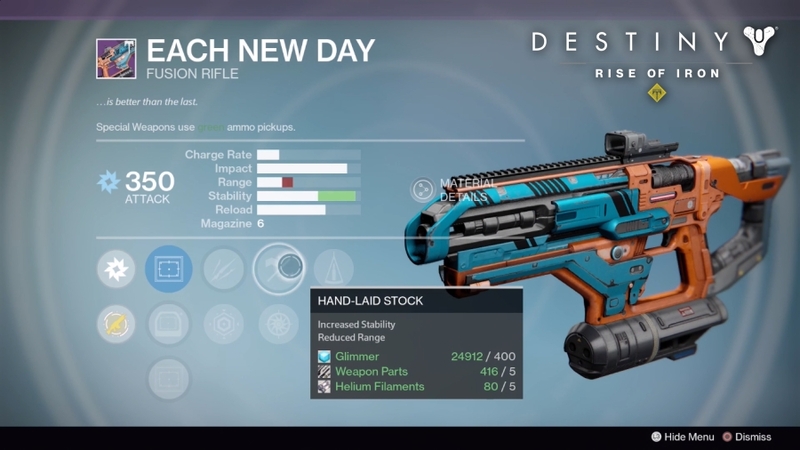 With the new Destiny Rise of Iron expansion comes the new vendor weapons. Now the question is on everyone’s mind that what are the Best Vendor Weapons in Destiny Rise of Iron? Well, there are only handful of of legendary weapons in Destiny Rise of Iron that are worth your time and money. 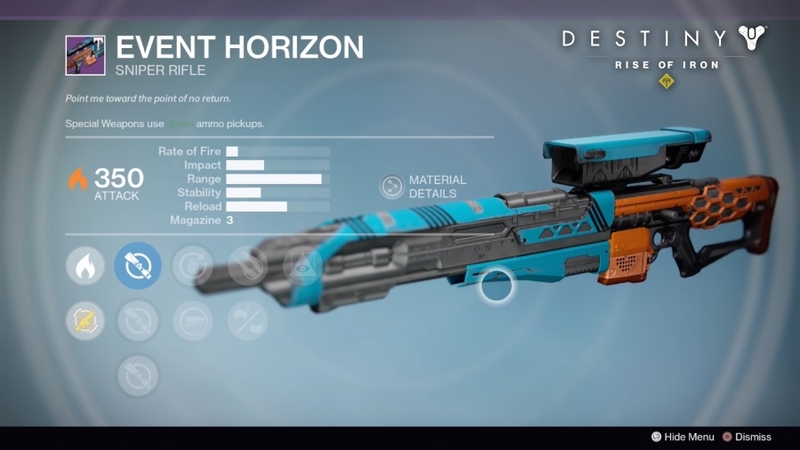 In Best Vendor Weapons in Destiny Rise of Iron guide we will show you all the legendary and Best Vendor Weapons in Destiny Rise of Iron. If you have some extra resources you should get these weapons as early as possible. Another great reason to get these weapons early is that they will definitely increase your light level. Following are the Best Vendor Weapons in Destiny Rise of Iron. The following article is organized by Vendor instead of a weapon type. The weapons listed below are among the better weapons available, so we will not discuss things that doesn’t impress or lead to immediate buy or may be require more testing. The First Vendor is Vanguard QuarterMaster. Vanguard QuarterMaster Vendor brought some great stuff such as ‘BoneKruscher’, ‘Disassembly Required’ and ‘Angel’s Advocate’. It’s Stability is total garbage but considering how slow it’ll fire, it should be manageable to control and you’ll probably be using Hand-laid Stock anyway. 25 in the Magazine is a little bit weak but considering the firepower, it’s understandable. You can carry great amount of rockets and ammo thanks to Field Scout perk. The 2nd Vendor is Dead Orbit. 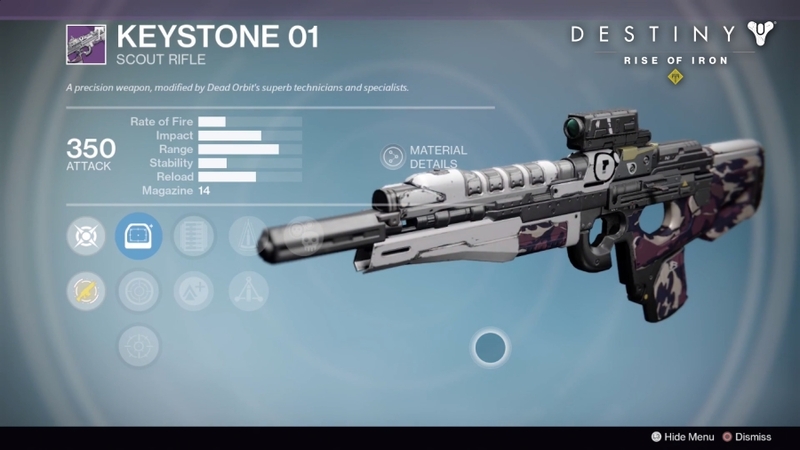 Dead Orbit Vendor brought some good stuff like ‘KeyStone 01’ and ‘Last-Ditch 001’. 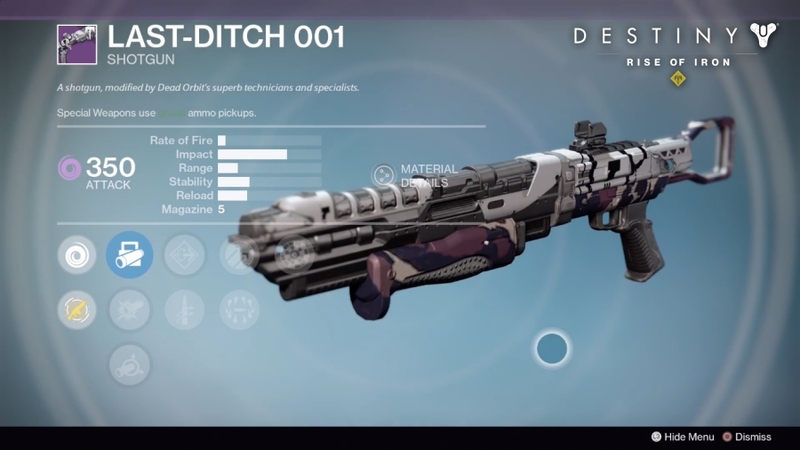 Next we have that may end up being the Shotgun that drive everyone crazy this year, the Last-Ditch 001. 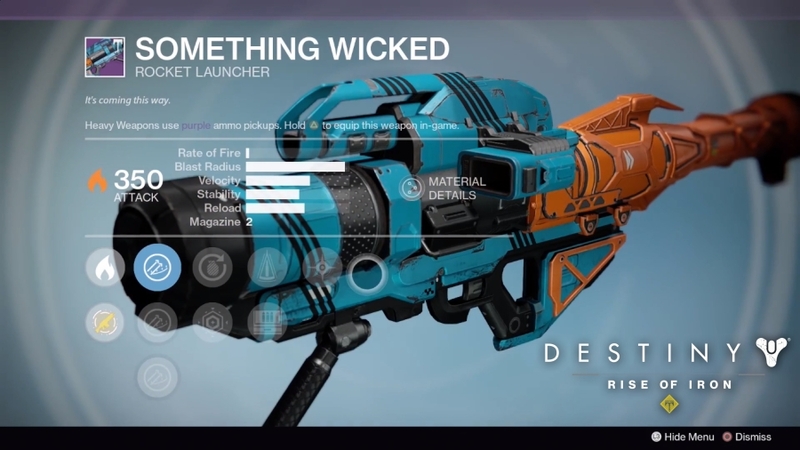 It comes with RangeFinder and Hammer Forged with Quick Draw that let’s you swap that quicker to blast someone’s in the face. 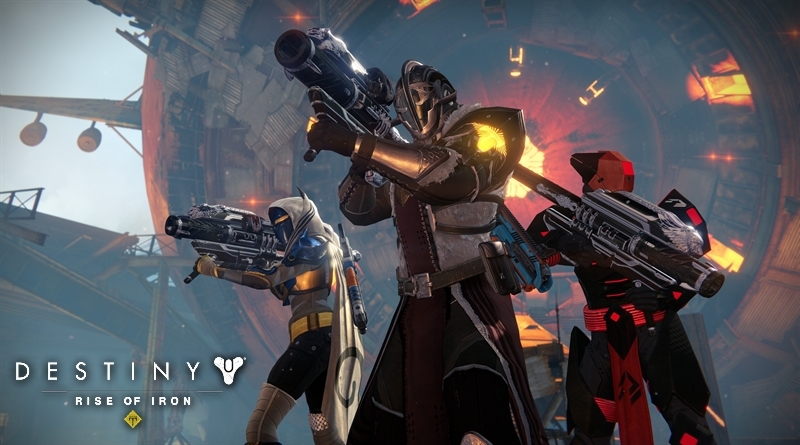 The 3rd Vendor is Future War Cult. Future War Cult Vendor also brought some amazing stuff with ‘The Wounded’. 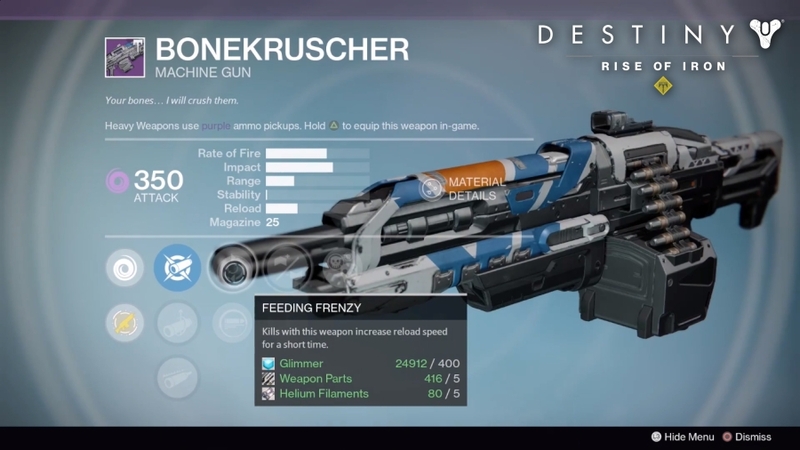 The 4th Vendor is Crucible QuarterMaster. Crucible QuarterMaster Vendor also brought some awesome stuff such as ‘The PalinDrome’, ‘Event Horizon’, ‘Chaotic Neutral’, ‘Zero-Day Dilemma’, ‘The Hero Formula’ and ‘Something Wicked’. The PalinDrome is probably number one on this list with a lot of other weapons here also being contenders. 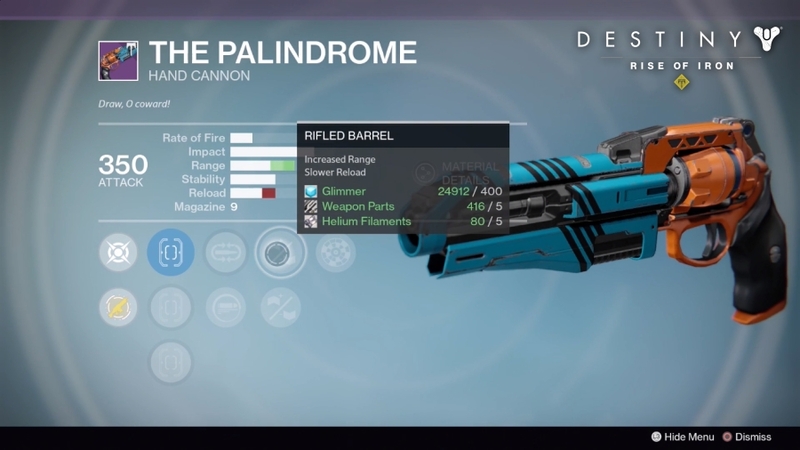 The PalinDrome is a great pick up considering its from a vendor. 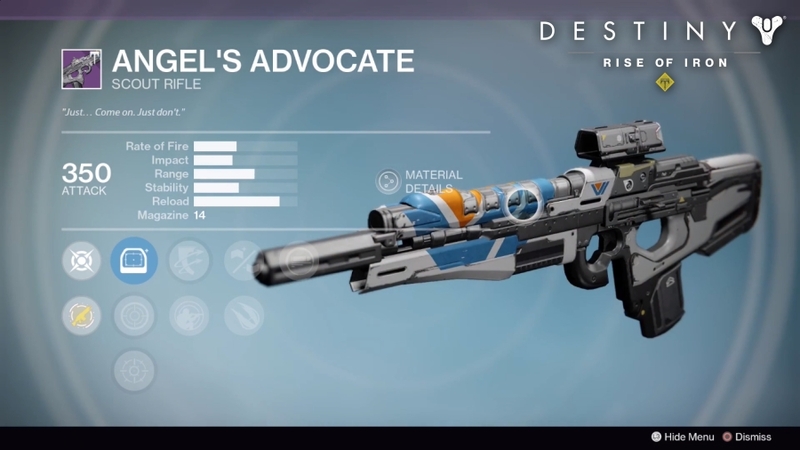 It comes with Rifled Barrel on it. 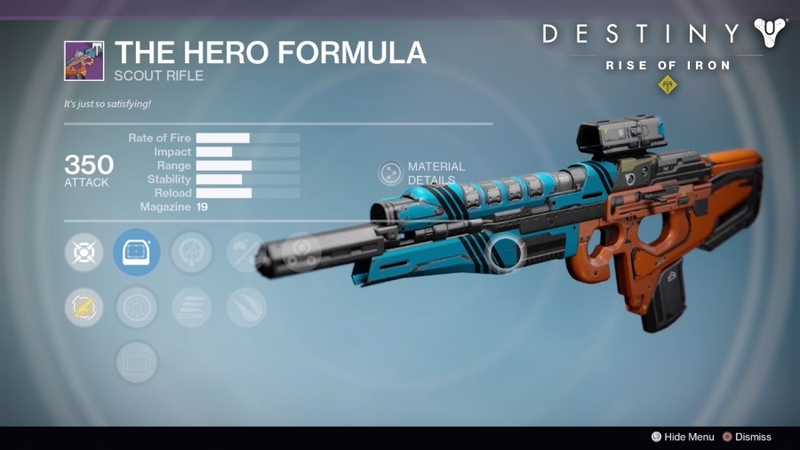 So it basically has as much range as a well rolled ‘Eyasluna’ plus it comes with RangeFinder and Spray & Play. The Hero Formula is a pretty interesting choice. 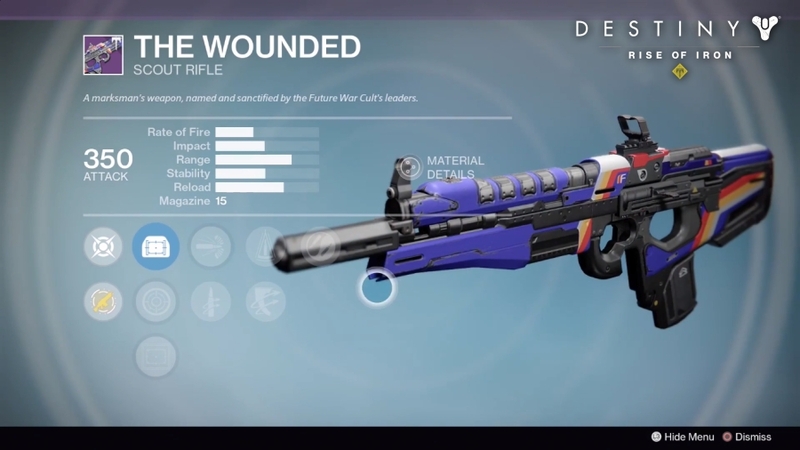 Its the super fast firing archetype of a scout rifle which has some potential in PVP. 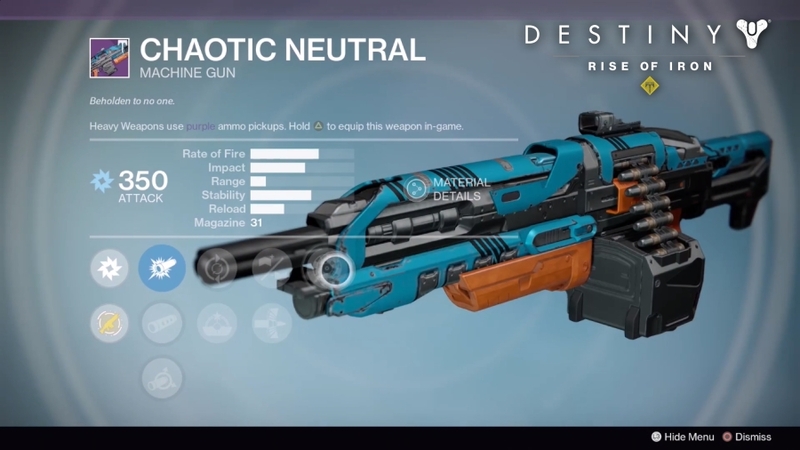 It comes with Braced Frame for a ton of stability which is normally a weakness for this kind of weapon. The 5th Vendor is New Monarchy. 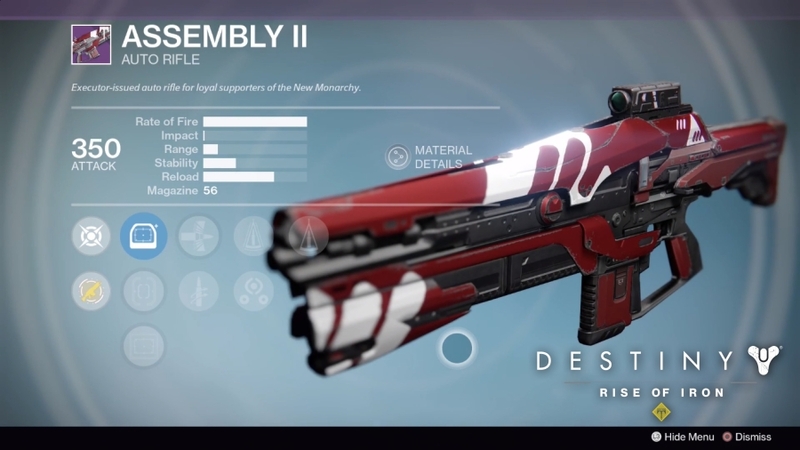 New Monarchy Vendor also brought some good stuff such as ‘Assembly II’, ‘First Citizen IX’. New Monarchy Vendor, unfortunately, do not impress me this time around. 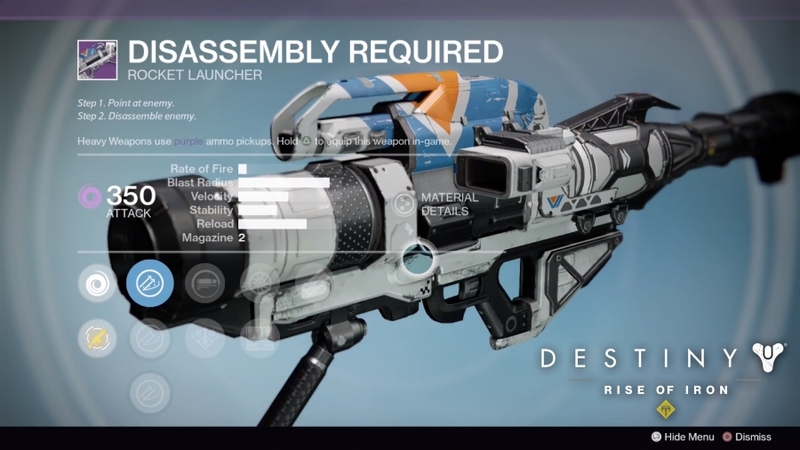 Assembly II, a bullet hose auto rifle, is probably as good as you’re going to get for a vendor bullet hose. 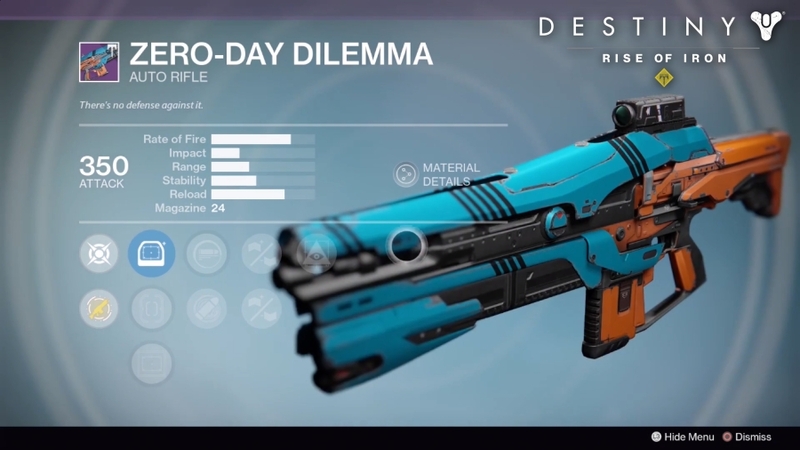 Counter Balance and Perfect Balance are a nice combo but if you already has a Doctrine of Passing (Auto Rifle), you probably just going to use that. Well that’s the full list of Best Vendor Weapons in Destiny Rise of Iron. We probably be stuck with these weapons for quite a while, so you have some time to invest in the weapons. And perhaps we will some weapons not on this list shine more than those we listed above. If you know any other Best Vendor Weapons in Destiny Rise of Iron, please share with our reader by commenting below.